The smallest bluetooth reader for magnetic cards in the world. You can control the device directly from your telephone with the help of a bluetooth. The device is compatible with Android and IOS. It is extraordinarily easy and reliable to work with. Has a wide coverage, about 35 meters in any visibility! 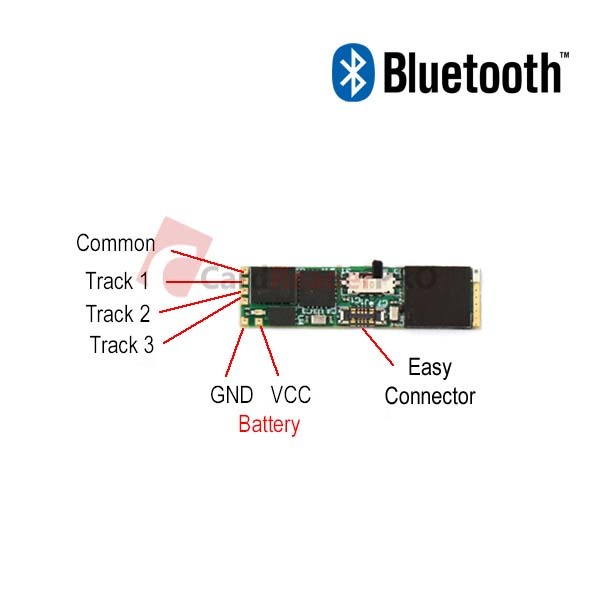 You can connect the MSR to a computer by means of a USB port, as well as wirelessly using a bluetooth with Android and IOS. MSR030 with ON/OFF micro switch. This MSR can read all 3 tracks on the magnetic card. It has very low energy consumption and can stay in work mode for about 4 days / 104 h / with 9mAh battery. All data is recorded on device memory, which can hold up to 3040 recordings. After turning on the device, the LED flashes and it is ready to operate. After you interrupt the connection to the device, in 20 minutes it gets into sleep mode. The sleep mode continues for 100 min. and, during this time, the bluetooth is invisible for your telephone and does not emit any signals, but continues to perform the preset functions. After 100 minutes, the bluetooth turns on once again and the device is visible for your telephone and, once again, you can make any adjustments /delete memory, download information, adjust the time, change a password, change a name, etc./. Once again, after you interrupt the bluetooth connection with the device, in 20 minutes it gets into sleep mode. This results in cyclicity. - 12:00 h : Turning ON micro switch. The bluetooth device is visible for your telephone for 20 minutes. -12:20 h : Bluetooth gets into sleep mode. The sleep mode continues for 100 min. and, during this time, the bluetooth is invisible for your telephone and does not emit any signals, but continues to perform the preset functions. -14:00 h: After 100 minutes, the bluetooth turns on once again and the device is visible for your telephone and, once again, you can make any adjustments /delete memory, download information, adjust the time, change a password, change a name, etc./. Once again, after you interrupt the bluetooth connection with the device, in 20 minutes it gets into sleep mode. -14:20 h : Bluetooth gets into sleep mode. - This results in cyclicity.